July 2015 - Normal Property Cycle or Bubble Trouble? Recently there has been a significant amount media coverage about the so-called Sydney property bubble. So are we in a bubble or aren’t we? How much growth is left in the current growth cycle? I’ll uncover the facts of what’s really happening at the coal face. Plus check out our latest seminar, client stories and business award. Normal property cycle or bubble trouble? 1. Normal Property Cycle or Bubble Trouble? Recently there has been a significant amount media coverage about the so-called Sydney property bubble. So are we in a bubble or aren’t we? How much growth is left in the current growth cycle? Is it too late to buy in the current property cycle? Complicating matters is that there is no universally accepted definition of a housing bubble. The phrase does grab reader attention in media articles though. For the record, I don’t believe we are in a bubble. Sydney is simply experiencing very strong growth fuelled by unique economic conditions and historically constricted supply (and we still have some more growth to come). This newsletter is a little longer than usual as I want to explain some key truths. The Australian Bankers Association (ABA) recently released a report entitled ‘Key truths on housing in Australia’ that defined a bubble in the context of residential property as “when buyers push up the prices of properties based on their assumptions that the value of those properties will continue to rise into the future. As such, they are not purchasing the properties primarily as shelter or as income producing assets but are betting on strong future asset price appreciation to generate a return.” The ABA argues that this is not currently occurring and while investors use property to build wealth, they do not commonly trade property based on short term speculation. In fact, the number of listings in Sydney and Melbourne is down 15.7% and 20.2% respectively compared to this time last year. Domain Group describes a housing bubble as “a period of above-average levels of house price growth that is followed by a drop in prices, back to or lower than the point where the growth started.” They note that “for a bubble to form, something outside the norm must push prices upwards and then change, creating the drop,” for example the entry and subsequent exit of a large mining company near a small town with no other strong industries. 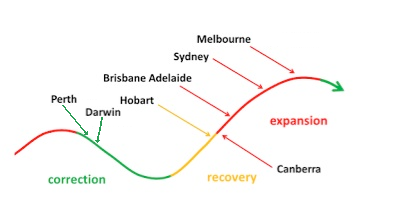 “If no fall eventuates, it can be argued the growth is a result of ‘fundamentals’.” Domain Group’s senior economist Andrew Wilson, “we do not – and should not - have a bubble” across Australia, however there are as many ‘property markets’ as postcodes and each has their own set of factors that influence the behaviour of buyers and sellers. Due to the transaction costs and inherent risk property investment involves, it is important to view property as a long term investment and not get swept up in the hype surrounding the normal property cycle. Instead, it is best to take a factual, longer term perspective as property should be viewed as a long term investment. Admittedly it can be difficult to determine where the truth has been swayed or a little stretched sometimes. 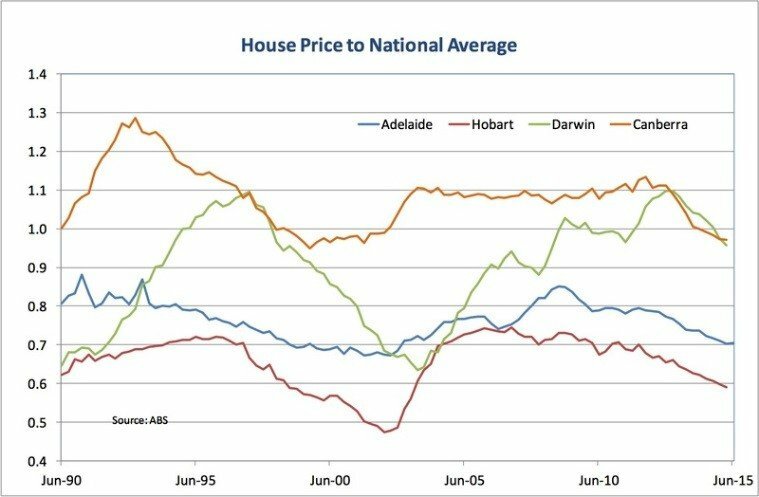 The below graphs illustrate the median house price of each Australian capital city from 1990 compared to the national average based on data from the ABS. As you can see, while the Sydney median house price has grown strongly over the last couple of years, it is just returning to its position as Australia’s premier city after a decade of lacklustre growth. In fact, in the eight years to December 2011, Sydney house prices rose by a mere 10% (or an average of 1.2% per year) compared to the national average of 40% (or 4.3% per year). Taking into account the early part of Sydney’s current boom and the 10 years prior to July 2013, Sydney ranks last among Australia’s capital cities in house price growth. Therefore, a significant portion of Sydney’s growth in the current boom can be explained as ‘catch up’ growth. The current property boom appears to be confined to Sydney and parts of Melbourne rather than the broader and larger property boom Australia experienced in the early 2000’s. As a result, interest rates and negative gearing policies are likely not to blame for the current boom as some media articles have alluded to. Further, Sydney prices have grown strongly by 38.8% since the start of the current property boom, but this still doesn’t match the 60.2% growth Sydney experienced over the same period since the end of 2001. Melbourne – home values began rising from May-12 and have increased by 23.6% compared to 58.0% over the same period post-2000. Nor does the recent Sydney price growth match the historical residential real estate boom in Japan and the US which grew by 160% between 1985 and 1991 and 130% between 2000 and 2006 respectively. Many cities have also grown faster than Sydney since 2000, including slow-but-steady Brisbane. 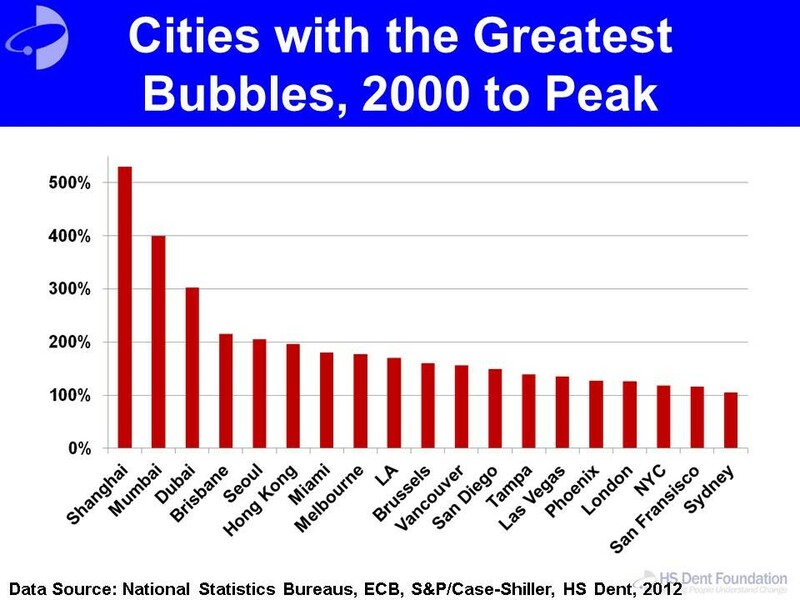 Duncan Hughes noted in the AFR on 6 June 2015 that the mixed performance of housing markets across Australia “has caused some leading analysts and advisers to challenge Treasury Secretary John Fraser’s claim that there is ‘unequivocally’ a housing bubble in Sydney and evidence of a ‘bubble in the higher-priced areas of Melbourne’.” The below graphic illustrates the normal property cycle and the mixed performance Mr Hughes referred to. To see what sort of decline is possible in the correction phase, we can look to history to provide a guide (although obviously this is not a forecast). 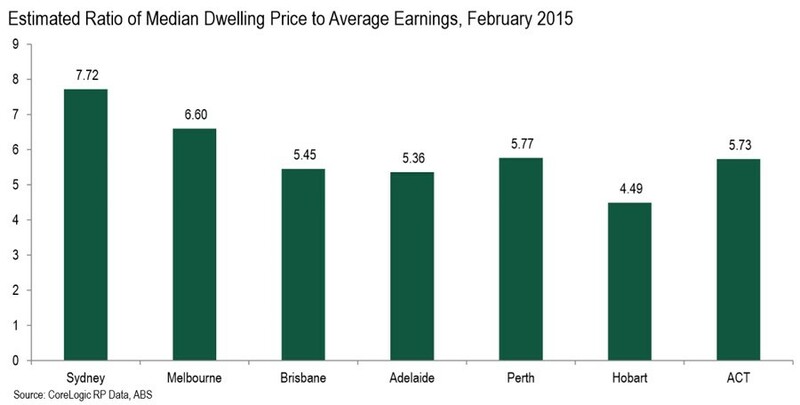 The below graph shows that Australia has had six house price corrections over the past 45 years. The largest correction was in the mid 1970’s when real house prices fell by 15.3% across Australia and by about the same amount in Melbourne and Sydney after land prices in Sydney had been rising by 5% a month. Following the 2001 to 2004 boom when combined capital city home prices rose by 52.1%, median prices only dropped by 2.1%. The below graph shows that buying a median priced property in Sydney now requires 7.72 times the average NSW annual income, however there has been a national downwards trend since 2009, as shown in the subsequent graph. 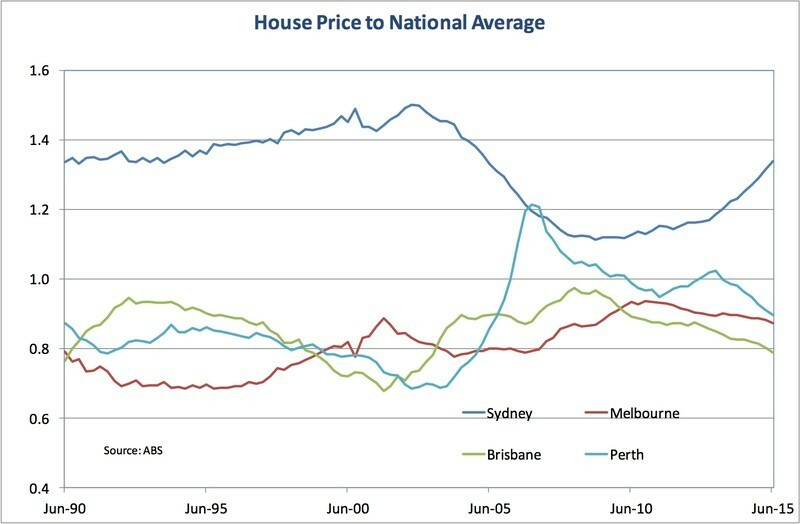 The fact that the ratio of national dwelling prices to average earnings was declining during a period of sustained low interest rates and that the current boom is not Australia wide shows that other factors are at play such as ongoing demand to live in Sydney due to its relatively strong economy and limited supply of housing stock. In recent years households have actually been able to reduce their debts due a combination of lower interest rates, saving more and cautious spending. As shown below, household’s ability to service their debt has actually increased over the past few years due to lower interest rates despite record household debt levels. Due to improved debt serviceability, there is no widespread evidence of financial distress. 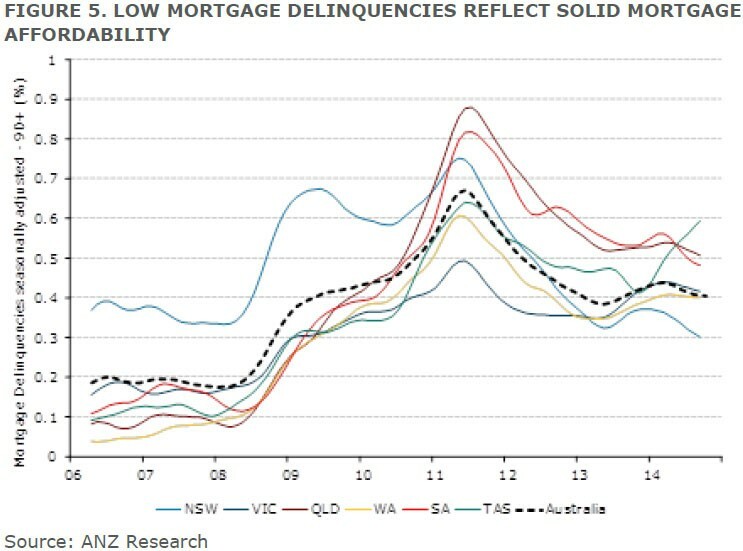 In fact, ANZ found that mortgage delinquencies were trending lower for most of last year and were around 0.4% for Australia on average and around 0.3% for NSW. Other popular affordability measures include the ratio of household and housing debt to disposable income. The below graph show that while Australian household debt is at the highest level on record, it has broadly increased in line with household income since 2007. Since the mid 2000’s we have only seen subdued growth in household debt. 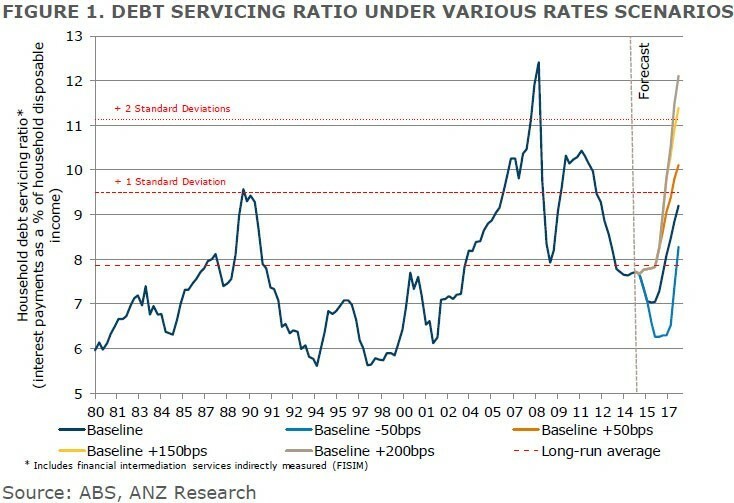 To control any possible speculative investment, Australia’s financial services regulator indicated to lenders that if growth in lending to investors exceeds 10 per cent per annum, further regulatory action to restrict lending growth may be considered. 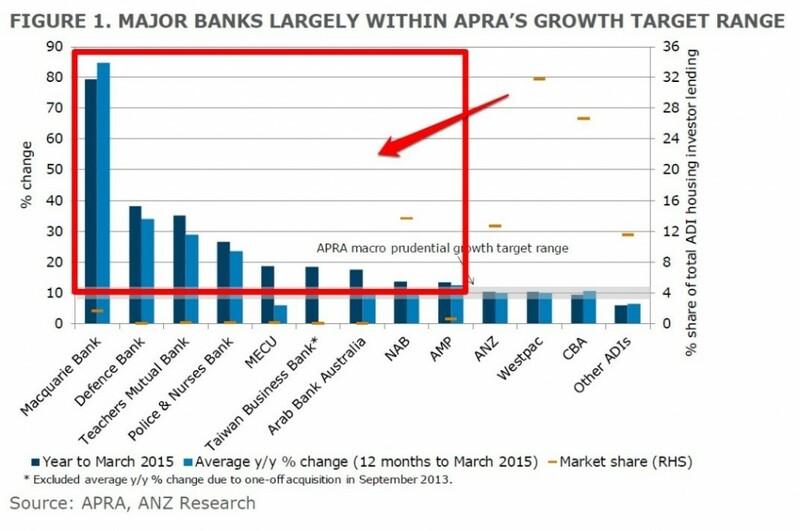 Since that time, the big four banks have limited their growth in lending to investors to around that level while a number of other lenders are significantly above the 10 per cent mark. It’s easy to get caught up in the hype at the moment, but if you seek out the facts and do your own research or consult a professional buyers' agent to assist you, you will be able to secure yourself a quality, long term asset that will meet your wealth creation goals and generate good income for years to come. You are warmly invited to our information packed seminar on Property and Immigration. Discover how to research the Australian property market and buy property like a professional. We will also illuminate the best and fastest pathways to securing permanent residence for those seeking to migrate to Australia. There are now massive incentives to gaining Australian permanent residence as fast as possible given the Federal government has recently announced tough new laws about how foreign buyers being more closely scrutinised when purchasing property in Australia. If you are a foreign investor or looking to migrate to Australia, you need to clearly understand the new regulations and how they will impact you and your family financially and physically – where and how will you be able to live in the immediate future? Get clarity and insight into the current real estate market with Rich Harvey, CEO of Propertybuyer, and Australia’s multi-award winning buyers’ agent. Justin Rickard, Australian Solicitor & Barrister, registered migration agent & professional migration law teacher as well as founder of australianimmigrationlawyers.com will outline proven success strategies to gain Australian permanent residence as fast as possible, so that the new foreign investment & migration rules do not threaten your real estate investment plans. This event will book out fast so reserve your ticket early. The judging process for the 2015 Australian Achiever Awards for NSW's Real Estate Services category was completed on 2nd June and we proudly for the 3rd year scored Highly Recommended! Now into its 18th year, the Australian Achiever Awards are an independent, unbiased award system based on assessment ratings from a business's own customers -an indication of a well run business where satisfied worthy of praise and increased custom. They were professional in everything they undertook on my behalf - particularly when it came to negotiating prices. We talked things through and I found they were flexible and supportive. I am very satisfied with the overall service I got from working with propertybuyer because I am very happy with their all round professionalism. I have written to them to tell them how happy I was with their service. There were great to work with, they explained everything clearly and they delivered what they said they would. I was very pleased when I started to use their services because I found them very professional in their approach and attitude. Also, their skills are very good - better than mine - as is their knowledge of the market and property in general. I am more than happy with the way they do things on my behalf and that they let me have input in how they manage things. Do you read online reviews and believe business awards are important? We do, and so do our clients. Your opinion matters to us, that's why we'd would greatly appreciate if you could take a few moments to review your experience and nominate Rich Harvey, propertybuyer for the Investor Choice Awards. The Investors Choice Awards, in partnership with Homesales.com.au, is seeking to identify the country's best property investment professionals by popular vote. If you're happy with the service you've got from us, I'd be thrilled if you would take a moment to register your vote at the official website. What's more, you've got a chance to win an Apple Watch or Samsung Gear S just by simply voting! Please vote for us today - and make your voice heard!